This German real photograph vintage postcard has to be one of the most moving that I own. It was produced by Photochemie, a Berlin company with their own printing plant and appears to be a bromide print judging by the overall matte surface but light, almost metallic-looking tarnishing around the edges of the central image. 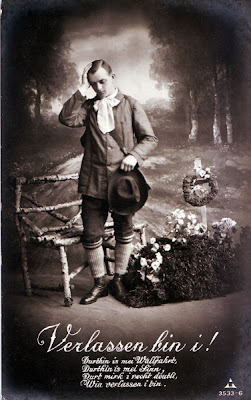 The theme of being forsaken on this card is a frequent one on early vintage German postcards, but more often than not they deal with the temporary separation of sweethearts, rather than death and loss. 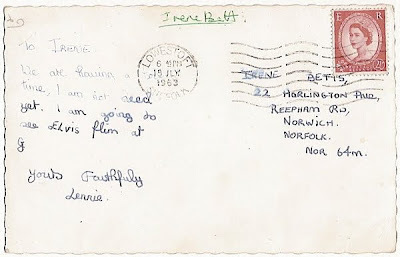 Whilst the postcard is uncirculated and therefore undated, its divided back and the clothing give us a few clues as to when it might have been produced. Germany introduced the divided back in 1905 and from the style of the traditional clothing which looks more Austrian than German I would say that this card is no later than 1914-15 and beginning of the First World War. This is, I hasten to add however, only a guess. If anybody has any other suggestions, please drop me a line in the comments box! The words on the card are from the second verse of the Carinthian folk song Forsaken (or rather Verlassen Bin or sometime simply Verlassen), written by Austrian composer Thomas Koschat (1845–1914) in 1862. Koschat formed the Koschat Quartet (Rudolf Traxler, Walter Fourness, Georg Haan and Clemens Fochler) and was apparently rather well known in Europe and the US where he toured extensively. Outside Europe he may not be a household name, but certainly most people will be familiar with the music for this song which was adopted for James Montgomery's hymn The Lord is My Shepherd. Thanks to the Hymn Studies blog I managed to find a translation of the original folk song which fits the image on the card perfectly . 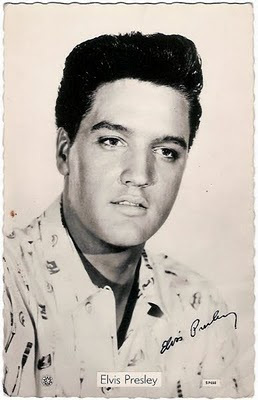 And kneeling I weep there, Oh, my love, loved for years. And there my heart turneth, I'm forsaken indeed. I promise to post something cheerier next time round! In the meantime enjoy listening to the music in the video at the end of this post or click here to view on YouTube. When I was a child growing up in the UK, whenever a place would get particularly busy or crowded it wouldn't be too long before an adult would exclaim: It's like Piccadilly Circus in here! This photograph taken almost twenty years before my birth shows just how busy a thoroughfare it really was even back in the 1950s. 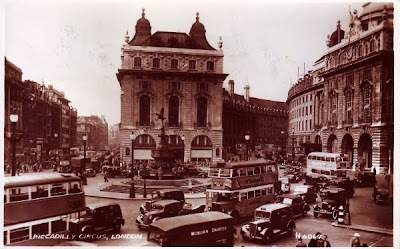 First built in 1819 to connect Regent Street with the major shopping street of Piccadilly (both visible in this image), with its memorial fountain and aluminium statue of Anteros, more popularly referred to as Eros, added in 1892-93, Piccadilly Circus is now one of London's most recognisable landmarks. The traditional double-decker London Buses are, of course, instantly recognisable too and the central bus is advertising another British institution - McDougall’s Self-Rising Flour! 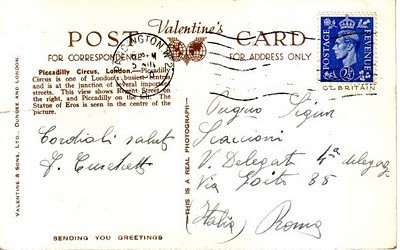 This sepia toned real photograph postcard was printed with a high gloss finish by postcard publishing giant Valentine & Sons Ltd. and on the reverse features its classic "Valentine's" logo with the initial V and two globes indicating their once worldwide business (they had long since sold their interests outside of Great Britain back in 1923). As was often the case with their photographic cards, this image has been named and numbered on the front by hand. The postmark on this card is hard to read but the year would seem to end in a zero, which I assume makes this a late usage of a 2 ½ d (old pence) George VI definitive postage stamp which was in use from 1937 - 1947. Whilst doing a bit of research about this postcard I came across this wonderful film - Journey by a London Bus in 1950 - a time-capsule movie which fits this post beautifully. Watch it below or click here to watch on YouTube! 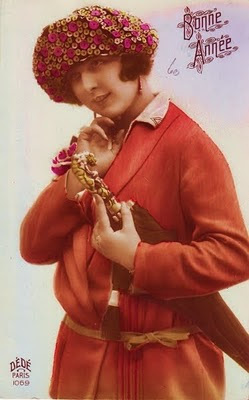 As the festive season draws to a close today with Twelfth Night, I thought I'd sneak in another French New Year's greetings postcard - a Bonne année real photograph postcard printed in France, but posted from Verviers in Belgium in 1926. 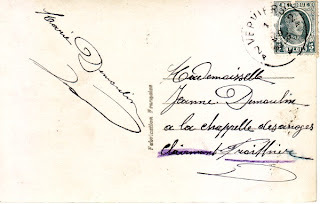 Published by Paris printers Dédé as part of series 1069, it's another wonderful example of a hand-tinted vintage postcard. I confess that my primary motivation for buying this card was that I fell in love with the detailed colouring on the woman's hat! It's also such a perfect example of how postcards can serve as a historical record of fashions and styles of different times. Happy New Year! I was thrilled to discover that the Vintage Postcard Gallery has kicked off 2010 with a huge honour - the One Lovely Blog Award. Massive thanks go to Christine at The Daily Postcard for naming the gallery. Christine has set herself a challenging mission - to try to post a postcard every day! Her blog is full of vintage gems and is a highly recommended read! As a recipient of this award, the only requirement is that the award logo is pasted on your own blog together with a link to the person who awarded it to you, and then award it to other lovely blogs, and link to them as well. So here goes with some of the loveliest blogs I regularly read ...not all of them postcard collectors' blogs! Untouched photos of what is splendid, beautiful, unexpected, or unusual by Beth Niquette. American photographer Heather Jacks currently lives on the beautiful island of Sicily and shares her photographs of the place. 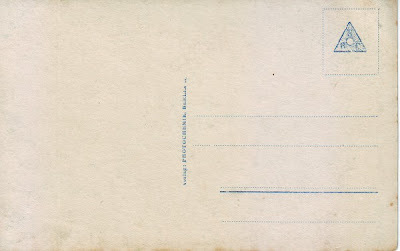 Dave Dubé's art on envelopes - fascinating and beautiful!